✓ Up to 2000 lbs. Any load handled easier, safer, and more efficiently. 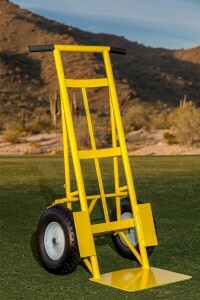 AZ Hand Trucks has a custom dolly to suit your needs. Flexible payment plans available upon request. Ask us about your options! Reduce Risk to Employees & Property. AZ Hand Trucks improve safety, reducing risk to workers and property and reduce staff costs. We are so reasonably priced, you’ll wonder how you functioned without us. To download, or print our brochure click here. 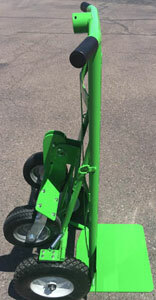 Our commercial grade Heavy Duty dollies have a weight capacity ranging from 1,000 -2,000 pounds. No more uneven loads with our flat free tires. AZ Hand Trucks, LLC can customize your dolly in many ways. Our custom dollies come in four bright colors (red, yellow, blue, and green). 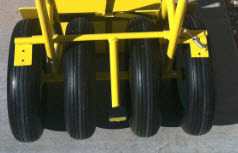 Choose the size of base plate, tires (flat-free or pneumatic), or weight capacity. We have many accessories to choose from. Our hand grips are coated with a durable abrasion-resistant texture. This coating provides comfort in hot or cold conditions. 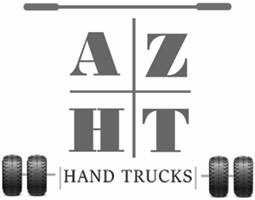 AZ Hand Trucks, LLC offers a patent pending one-of-a-kind brake system that is positioned to give your staff maximum pulling advantage with ease. Throw away those wheel blocks, protect your toes and feet, and get rid of those costly extra staff members. Our Standard Dolly, Standard Dolly Plus, Standard AT, Extreme Dolly, Extreme Dolly Plus, Rogue and Rogue Plus have a weight capacity of 1,000 – 2,000 pounds and pricing ranges from $579-$827, depending upon the tires and base plate selected. 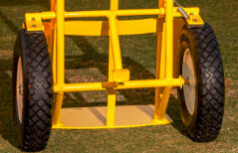 You can customize your dolly with an extended base plate and number of tires (flat-free or pneumatic). Since we fabricate each dolly to your unique specifications, we offer base plates for landscape use including tree boxes and heavy boulders. Movers of any product will find our custom hand trucks makes their job easier and safer. Our base plates are 1/4″ thick and are precisely cut with our HD-Plasma machine. AZ Hand Trucks, LLC offers your choice of Marathon pneumatic or flat free tires – knobby or ribbed – to suit your needs. Marathon is America’s flat free tire leader. We can fabricate any dolly to meet your unique needs. Give us a call with your vision. When it comes to buying a heavy-duty hand truck, AZ hand trucks is you’re #1 choice. 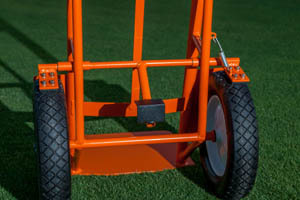 Our ergonomically friendly design and patented foot brake system takes the stress off you and your employees while moving heavy loads making us the perfect choice for moving companies, landscapers, construction workers, inflatable rentals, and much more. Our custom designers have also made customized dollies for emergency responders utilizing the jaws of life. There’s limitless uses for our products and we pride ourselves on providing solutions for your business. If you’re looking for a way to reduce workmen’s compensation claims within your business and you utilize a dolly or hand truck, we are the solution to your problem. We’ve had expert chiropractors observe employees using our product compared to our competitors and they have all unanimously agreed that our foot brake reduces stress on your body. Our products are the only ones on the market with the one and only foot brake system and while some others have tried to imitate our idea, none of them compare to the ours. Our professional engineering team has spent hundreds of hours perfecting the perfect model to not only handle large volumes of weight, but also to last for a long time. The landscaping industry has responded very well to our products because of the versatility and wide range of uses they are finding they can use our product for. All of our models can be equipped with a hitch that works wonderfully with our Hauler. This combination turns your hand truck into a pull-cart that can used for transporting sandbags, concrete, bricks, generators, and just about anything else that you can pull on a cart. We’ve tried to cover all of the basis and make your company more efficient and also create a safer working environment for you and your employees. Moving any type of vending machine can be a tough task depending on what kind of hand trucks and dollies you’re using. Our products are perfect for transporting snack machines, soda machines, ATM machines, and anything else you can think of. Most vending machines weigh in excess of 500 pounds which is no problem for our products to handle. When you’re moving a refrigerator, washer, dryer, or any other related item, our product is your best choice because of our sturdy design that is built specifically to easily move heavy loads. Hundreds of moving companies have bought from us because our designs are built to last. If you’re a mover and constantly moving around heavy loads, you’ve come to the right place. 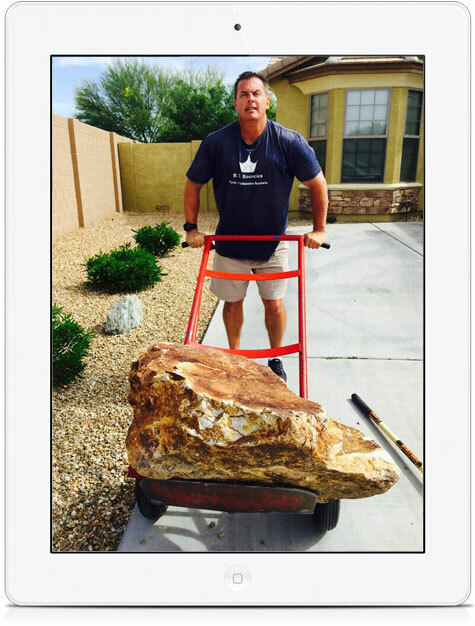 Love AZ Hand Trucks ? Give us a call today and let us build one for you. Choose from options on frame style and size, base plate configuration, D rings (for strapping) tire design and more. 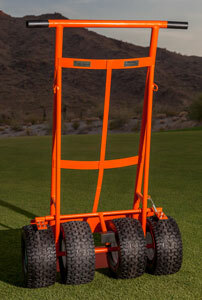 Not only can you choose equipment options, but can get your hand truck with company colors and logo. 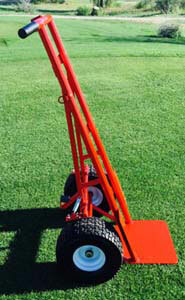 Hitches are easily fabricated into your custom hand truck. Accessorize your dolly with precision ball bearings, tie-down “D” rings and more . We can modify the base plate on any dolly to fit your material loads . Your custom dolly is fabricated by experienced and knowledgeable staff. 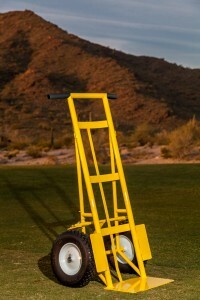 AZ Hand Trucks has 5 standard models to choose from. Or do you have an idea? There’s limitless uses for our products and we pride ourselves on providing solutions for your business. Have an Idea? Discuss it with our team and see what we can do with it. Industries served: Landscape, Construction, Handyman, Inflatable’s, medical field, professional sport teams and more. Do you have clients with pristine lawns and landscape? 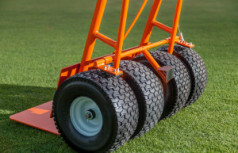 Our turf tires are just what you need. We offer 3 colors red, blue and yellow. If you would like it powder coated any other color that’s not a problem just ask and we can quote you a price. Welcome To AZ Hand Truck’s New Website! AZ Hand Trucks are Groovy Baby! Let’s add in the grooviness factor. Take it from Austin Powers (professional impersonator), you will not lose your Mojo with AZ Hand Trucks helping you to do the job.